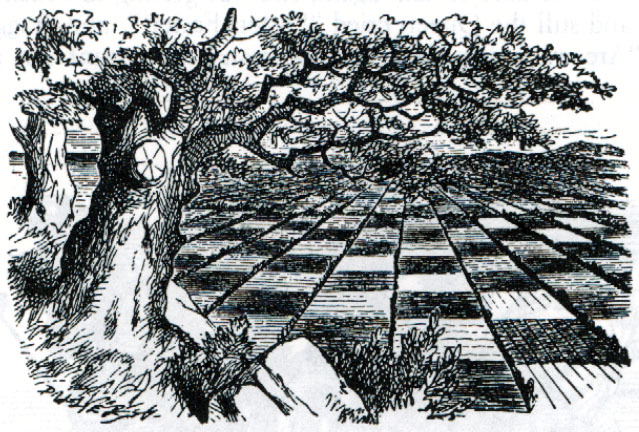 The Chess-board — Illustration by John Tenniel to chapter 2, "Through the Looking Glass,"
The Chess-board — Illustration to the second chapter of Through the Looking Glass by John Tenniel. Wood-engraving by the Dalziels. "I declare it's marked like a large chess-board!" Alice said at last. "There ought to be some men moving about somewhere — and so there are!" she added in a tone of delight, and her heart began to beat quick with excitement as she went on. "It's a great huge game of chess that's being played-all over the world — if this is the world at all, you know."